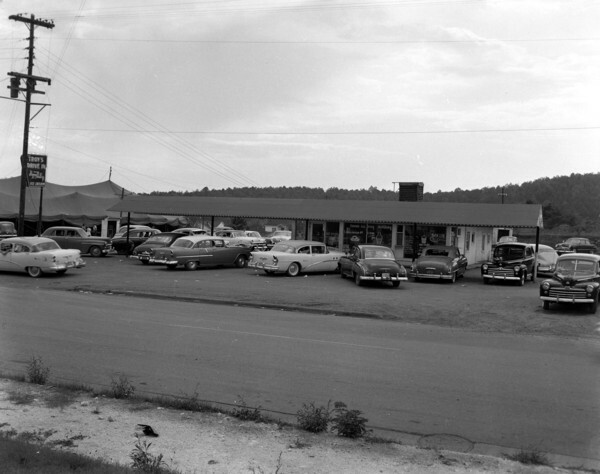 In the "Happy Day's" of the 1950s, Troy's Drive-In was the be-bop-a-lulu hang-out on North Commerce Street in Summerville. You weren't nothin' but a hound dog if you didn't make this hip scene, daddy-o. You could get Happy Valley ice cream, a hot dog for 25 cents, or half a fried chicken for a buck fifty, curb service included. You could strike up a conversation with some "Yankee snowbirds" in the car next door as they took a hamburger break from the road trip along pre-interstate-era Highway 27 from Michigan to Florida. If the large tent erected to the left is for a revival, the preachers better hope Troy closes up the jukebox inside the little shed in front. Otherwise, the hormone-hopping teenyboppers will be jivin' to the devil's rock n' roll music. Lordy, lordy, pretty soon they might even smart off to a teacher or experiment with "rabbit tobacco!" Troy's Drive-In was located where Henry's Bar-B-Que sits on North Commerce Street. Sometime in the late 1950s or early 1960s, Troy took his fry pit and moved to Rome, thus forcing all the cool kids to invade Tole's Drive-In on the Lyerly Highway. Photograph by T. Emmett Nunn. Courtesy of Chattooga Library. Copyright 2013 Greg W. McCollum. All rights reserved.